Even when you send a legitimate email message there are great chances it will be checked by your server, the recipient server or both of them. Nowadays it is a common practice for system administrators to use spam checking and anti-virus software directly on their email servers. The idea is to eliminate or reduce the relaying of spam messages and the spreading of viruses thru the emailing system. On one hand checking messages at server level can drastically reduce the amount of junk that will end up on your mailbox but on the other hand that system is far from being perfect and as a result, legitimate emails will also get caught and will never get delivered. Such messages are called 'False Positives'. 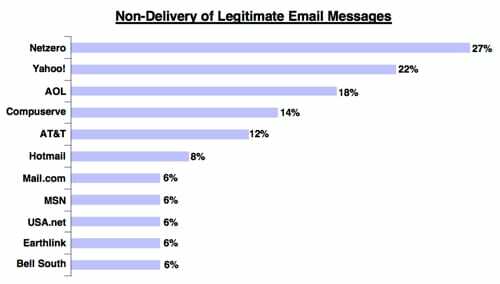 On average, 15% of legitimate messages do not get through to the inbox because of the false positive problem, and the rate is increasing along with the volume of spam. As the administrators of inbound mail servers draw their spam filters ever tighter in an effort to cope with the burgeoning flood of spam, it is inevitable that more and more legitimate email will get caught by the filters as well. Many inbound email policy makers are not aware of the existence, let alone the severity, of the false positive problem. Others are aware of the phenomena, but don’t necessarily see it as a “problem”. Some anti-spam measures, such as some DNS blocklists, create false positives by design, the intent being that the pain caused to a site by having their legitimate email blocked will lead to the site taking care of their spam problem in order to have the block removed. In a perfect world the sender should be notified as soon as a message has been blocked for whatever reason with what we call a Delivery Status Notification message (an automated electronic mail message about a delivery problem). However, since most of the spam is sent with forged headers or using an inexistent sender address, the server simply blocks or deletes an email message without notice as soon as it has been flagged as spam (after reaching a given score threshold) or marked as a possible viral threat. We have created a document that briefly delineates a number of measures to keep your spam score as low as possible and to enhance the chances of reaching the inbox of your subscribers. It is available here: How to avoid a message from being flagged as a spam.